Rather, they lead a value-adding network, goal determined, self-organizing and social – in other words: their business system. 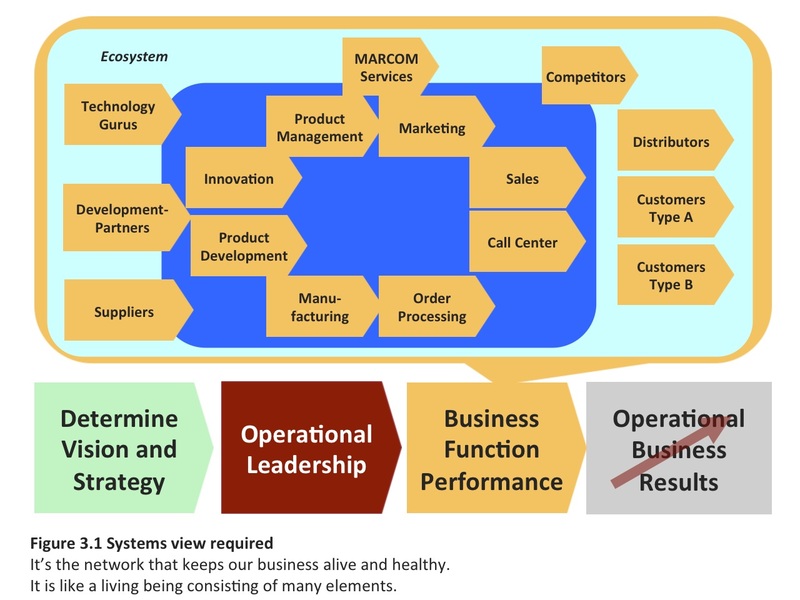 The systems view recognizes the company as one element in its business ecosystem. Within that it is a self-organizing and self-creating living being gifted with both physical and social features, where one function can constrain the whole. Hans-Peter Liebmann, Professor em. of Marketing and Sales, University of Graz (Austria). A clear, shared view of your business ecosystem is a non-negotiable prerequisite for constraint focused, agile operational leadership. You will require this view for each step of building or agile adjustment of your operational plan, to make certain that your plan based on facts and not on intuitive gut feel. If you perceive management NOT as an integrated function of the ecosystem a business system may not be self-organizing. ... you probably can agree, that a business is a self designing / self organizing system. This point of view stresses the role of management as the business nervous system. As leaders we are responsible, that it functions well. Lead projects rapidly and successful to results, within budgets. Build a shared system view with your entire operational team. Everyone who plays a role in the business ecosystem must attend and find their responsibilities represented in the view. achieve for the goal" and "actual performance". This is a candidate to focus on in the constraint focused operational plan. If your goal is for consistent growth it is inevitable that some functions will reach the limit of their capacity with growing load. These are candidates for obstacles in the operational plan.